In the previous lesson, we have learnt Quantitative Expressions and the Verbs, and we have also covered Verb ‘to be’ and the Compliment. We have explained the rules of agreement of Subject and Verb. In addition to these, there are also some rules of agreement between Nouns, Pronouns and Possessive Adjectives. We are going to learn all of them in this lesson with rules. First Person Pronoun Singular Number ‘I’ takes ‘me, my, mine, myself’. I shall have my chance. We shall do it ourselves. We shall have our chance. You should do your work. Rule 3 — Third Person Pronoun: Masculine/Feminine, Singular/Plural Number. Third Person, Singular Number, Masculine Gender takes ‘he, him, his, himself’. Third Person, Singular Number, Feminine Gender takes ‘she, her, hers, herself’. Nouns of Neuter Gender and most of the animals in the Singular Number take ‘it, its, itself’. He will do his work himself. She will do her work herself. Those boys will do their work themselves. Those girls will do their work themselves. This book is mine. I lent it to you some time back. Those books are mine. I lent them to you some time back. Every student has completed his work. A candidate should know his strong and weak points. A student should do his home work regularly. Readers are advised to keep their belongings outside. A student of the Women's College should be regular in her work. Every member of our club should pay her fee in time. The small child was crying for its mother. The baby fell down from its cradle. The cow is not in its shed. Note :– For pet domestic animals he/his or she/her are used. A son must obey his mother. (not her mother). A girl can learn many things from her father. (not his father). The purse has been returned to its owner. (not his owner). Possessive Adjective takes a Noun after it. i.e., My book, your house, his pen, their college. 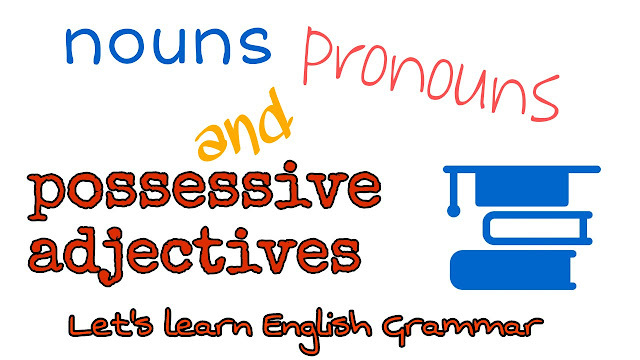 Possessive Pronoun has no Noun after it. As – This book is mine. This house is yours. This pen is his. This college is theirs.